← Is the U.S. Forest Service Hoping to Cash in on Wilderness Areas? BEULAH, MI — Fall is the time of year when Lake Michigan salmon start nosing their way up natal streams to spawn and die. 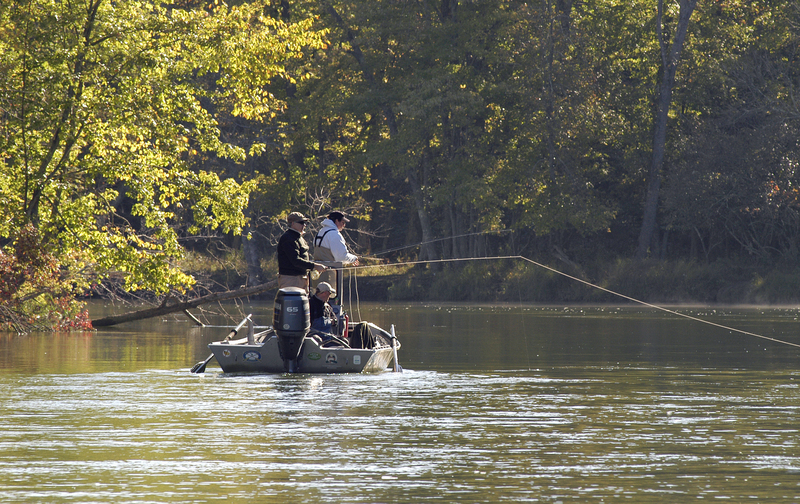 State fish managers, however, are uncertain about what to expect this season. Many of the salmon runs on the lake shoreline are slower than average. Switzer is in charge of raising 1.57 million coho salmon at the Platte River hatchery, which produces the young fish that are stocked every April in rivers such as the Platte, Boardman, Grand, Rogue, St. Joseph and Manistee, among others. Switzer relies on returning cohos to provide eggs for the stocking program. Just why Platte River cohos are missing this year is unknown. Switzer speculated that unseasonably warm conditions in September kept many out in Lake Michigan, where open-water anglers continue to catch them. But, biologists also said this year’s expected salmon, the mature fish born in 2011, didn’t get a very good start on life because of low alewife numbers in Lake Michigan. Big lake anglers this summer reported hit-and-miss results fishing for salmon, particularly the big chinooks, which eat alewives exclusively. Some predicted the fall chinook run might be weak. State fish mangers said that is proving true. Cohos, on the other hand, are running well on the St. Joseph, Kalamazoo and Grand rivers. 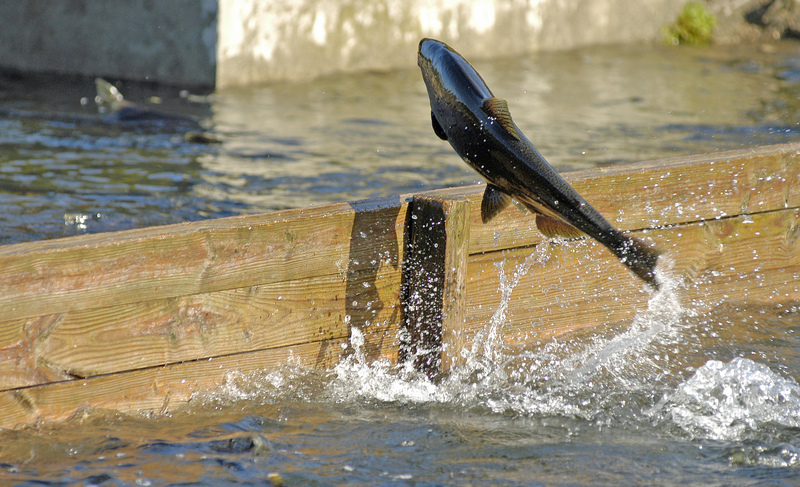 The DNR changed its Grand River coho stocking strategy in 2013 to improve survival. Hatchery cohos now are stocked at locations downstream of Lyons, rather than upstream in Lansing, shortening the trip to Lake Michigan and reducing the number of dams and predators they encounter. Wesley said the change might have improved survival and provided strays for the Kalamazoo River. The St. Joseph, he said, could be OK because of stocking there by both Michigan and Indiana. Scott Heintzelman, the fisheries technician supervisor who oversees the Little Manistee River Weir, where chinook eggs are collected, said the run there appears to be three weeks behind. To get his quota of 4.3 million chinook salmon eggs, Heintzelman needs 3,000 adult chinooks and a 50/50 split of male and female. Michigan will get 3.1 million or 3.2 million of those eggs. Illinois will get 800,000 eggs and Indiana will receive 400,000 eggs. Achieving that shouldn’t be a problem, he said, because fewer are needed than in the past. Lake Michigan now is stocked with 50 percent fewer hatchery salmon because of a change in 2013, when surrounding states agreed to try to conserve alewife populations. Michigan now plants only 559,000 chinooks, rather than the 1.6 million annually in the past. For river anglers, that might not be much consolation. But, the good news is lake anglers have reported catching robust and healthy 2-year-old chinooks. Were they not in the mix, there would be much more to worry about. Those fish will run the rivers next year. This entry was posted in Uncategorized and tagged Chinook Salmon, Conservation, DNR, Fishing, Lake Michigan, Michigan Department of Natural Resources, Rivers, Salmon. Bookmark the permalink.